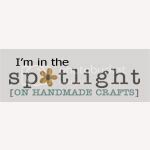 Storing or organizing the beads, beading supplies and the tools is quite a job. 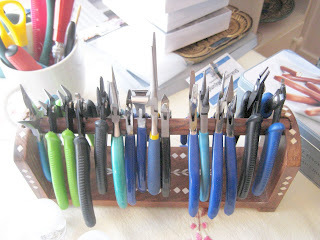 Here, I found a great idea for storing the beading tools. I was keeping them inside a big cup or jar, or laid them flat on a tray but some how they tend to get all mixed up. Inside the cup or jar they got tangled with each other and it was cumbersome- did not quite work out. My friend, Suparna, another jewelry artist from Ottawa, Canada came up with a fantastic idea. She uses a bangle display to stand her tools. The legs of the tools are just right for that width of the bangle holder and the tools look really organized and beautiful. Suparna chose a Rajastani wooden bangle holder from India. Even if I can not manage to find such a lovely piece, I think an ordinary velvet bracelet holder will also do the trick. A better picture added- This image credit : Suparna.M. 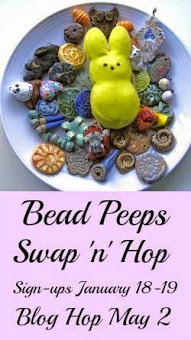 Want to see some more bead storing ideas? How do you store your beads and tools? Please leave your comment with your link so that we can visit your wonderful site too. Thanks Dita, Can I senjd you a btter picture ? A better picture? Sure, Suparna. Thanks, Cynthia. I browsed at your etsy store and was like a girl in a candy store. Also "liked" your FB fan page. Do you want me to send a better picture?